It wasn’t unlikely. Years before, Burton’s 5-year-old son had been killed when he ran into the street and was struck by a car being driven by an off-duty police officer. Wild with grief, she took drugs, became addicted, got arrested for a nonviolent crime, went to prison, got out and then did it all over and over again for nearly 20 years. Her relationship with her daughter, who was 15 when her brother died, collapsed. In 2011, A New Way of Life’s five homes served 40 women and 13 children at about a third of the cost of incarceration, which in California averages about $47,000 annually per inmate, according to the state department of corrections. Recently, A New Way of Life has moved beyond basic social services. The organization now distributes $2 million in donated goods each year – everything from diapers to can openers. What grew from there is, according to Sarabia, California’s largest agency helping people to expunge criminal records – an important step toward employment. Since 2008, A New Way of Life has successfully purged hundreds of criminal records and fought denied applications for licenses in various fields, such as home health care. Already three clinics like it have opened in southern California, with a fourth on the way. 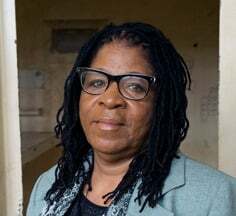 Now Burton is advocating for former inmates on the national level with the groups All of Us or None and the Formerly Incarcerated & Convicted People’s Movement, both of which she helped found. With about 1.6 million people currently incarcerated, and 95 percent of state prisoners slated for release, the need is great. 2015 Update: Susan Burton received the James Irvine Foundation Leadership Award in 2014. In 2015, the Los Angeles Times named her one of the nation’s 18 New Civil Rights Leaders. A New Way of Life (ANWOL) re-entry homes have provided safety and support to more than 850 women and children, with over 160 women reunited with their children, and have helped more than 3,000 formerly homeless individuals acquire needed items to establish their own homes. Since ANWOL’s inception in 2007, its legal department has provided pro bono services for over 2,000 formerly incarcerated and convicted individuals.